Discover how internal audit and compliance professionals are using the power of self-service data analytics. We will share on how the professionals have leveraged data to do their jobs better and faster – And have been recognized for making an impact in their organizations. This event is specially catered for Internal Audit Division of all ministries and agencies in Malaysia. 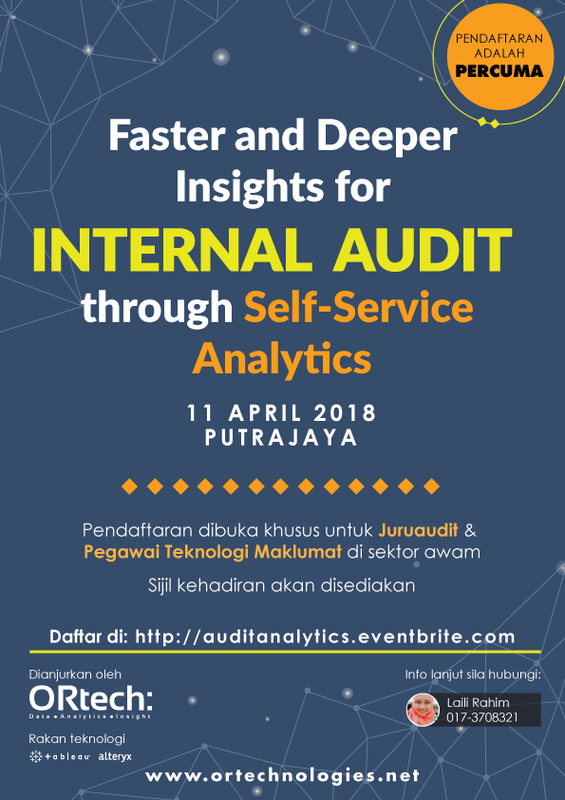 Auditors without programming background and IT personnel are most welcome to join us to discover and experience how self-service data analytics can boost up the performance and effectiveness of your Internal Audit Division. 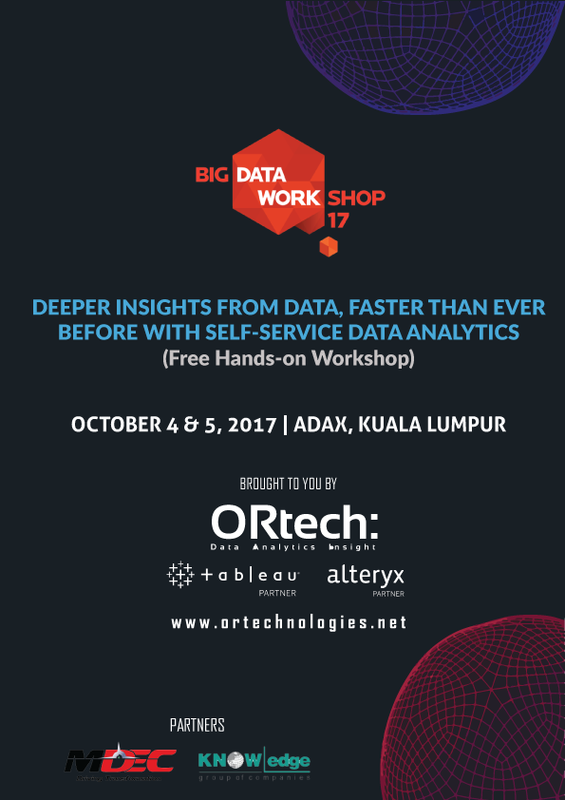 You will also witness the most powerful self-service data analytics tool hands-on demo in person. A tool that will deliver deeper insights in hours, not weeks. Analytics for everyone: Everyone in an IA Team can perform analytics and build auditory dashboards – It’s a cultural shift. Greater insights – Transform audit, increase audit quality, and create more impact. Increased coverage – Identify more risks and opportunities. Generate and deliver more forward-looking recommendations quickly – From auditors to business advisors. Minimal Investment, tangible and quicker ROI. Tableau Free Trial will last for 14 days. 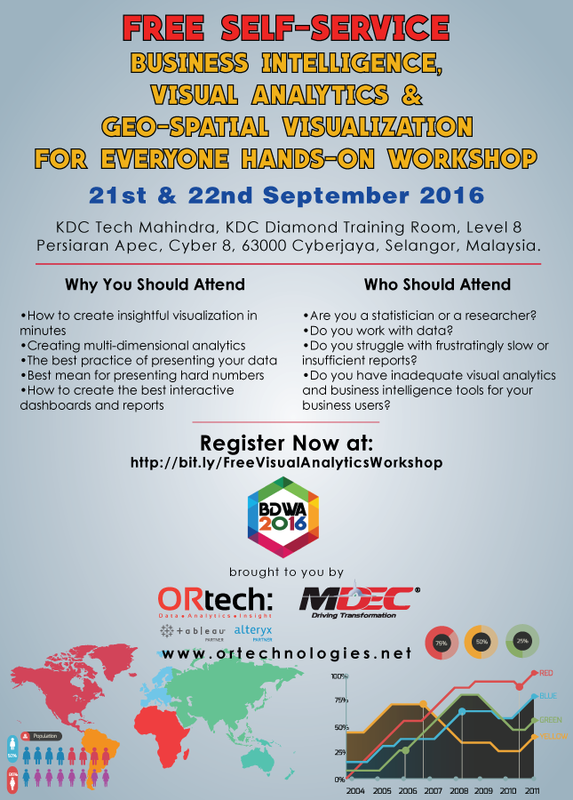 It is advised that you install Tableau a week or few days before the workshop date. 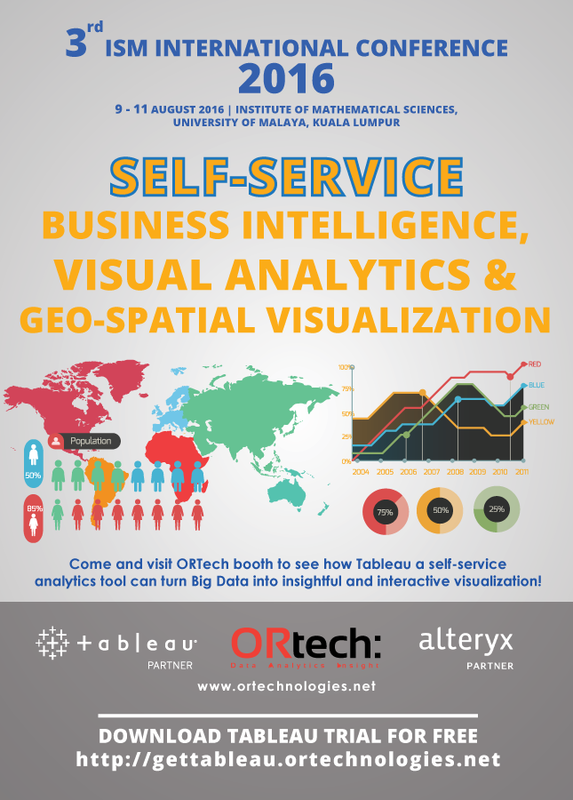 In collaboration with MDeC, OR Technologies is pleased to help you to see and understand your data using Tableau, a Self-service Visual Analytics tool. Tableau is all about making data analytics fast, easy, beautiful, and most importantly— without the need of technical skills. Helping people gain insight into their data to solve unexpected problems is what drives us. Public Service Department of Malaysia will be organizing a monthly gathering that will be held on 19th July 2016, Tuesday at JPA Auditorium, level 4, block C1, complex C, Putrajaya. This year theme is futuristic which is in line with the solution that we will be presenting which is Tableau. 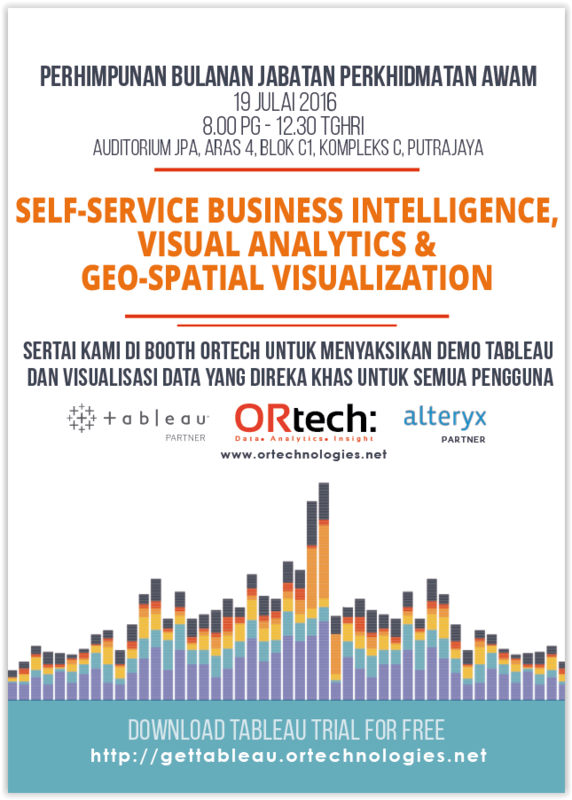 Tableau in a sense is a futuristic visual analytic tool that helps people to see and understand their data with just few clicks and without the need of technical skills like programming. 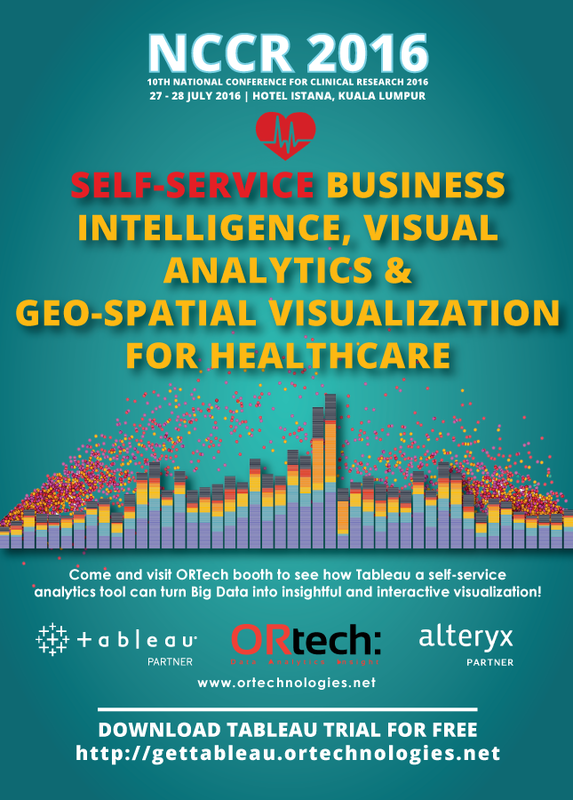 Come and meet us at our booth to witness how Tableau can turn your data into insightful visualization and its futuristic features!